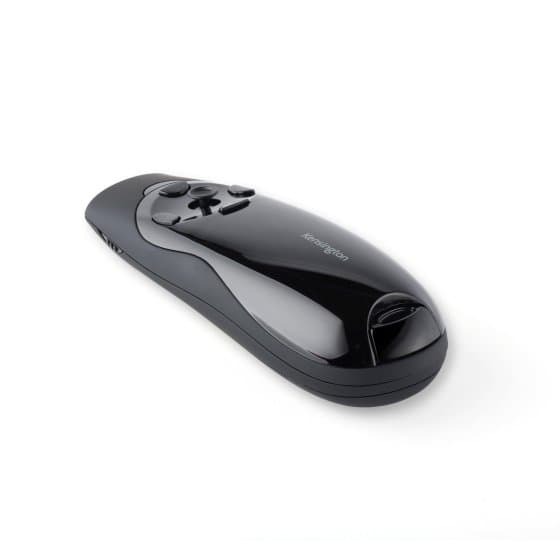 Also known as clickers, presenters, PowerPoint remotes, presentation mice, presentation pointer, remote point, professional presenter, etc, these devices can be used to wirelessly switch slides during a slide show presentation. There are many different types of presentation devices and some may function slightly differently. These devices have a mini USB receiver, which can usually be found inserted into the bottom end of the remote or inserted near the batteries, under a removable cap. This USB receiver will be inserted into a USB port on your computer. Properly charged batteries must be inserted into the clicker for it to function properly. If the USB receiver is plugged into the computer and the presentation device is powered on, you should then be able to use it to change slides in a slideshow through many different programs, primarily a PowerPoint presentation (or similar) or an image slideshow. Remove the USB receiver from the device and insert it into the USB port on your computer. The USB should then prompt a device driver to load, which will take a few moments before your presentation device will begin to function properly. Turn on the presentation device and test the functions of all available options. If you plug in the USB receiver and the computer does not respond in any way, unplug it, restart the computer and then try again. If you still have problems, try to plug it into a different USB port. If you plug in the USB receiver and it seems to download the device driver properly, but you cannot get the device to function, check the batteries in the presenter unit and make sure it is powered on. If you receive an error message when plugging the USB receiver into the computer, check the capabilities of the device. It may not function on both Mac and PC, so if you try and use it with a device that is not supported, it may not work. The capabilities of some devices can be found on the manufacturer's websites, a few of the popular ones are listed below. This device comes in many different brands, shapes, and styles. Some of these devices may have different capabilities, such as laser pointers. The MO1174-T Clicker (Picture 4) can also control the computer mouse, which the others pictured here cannont.